Playing for the Californian farm league in the 60's, the Peanut Butter Conspiracy focused on sunshine pop that fused the drive of the Jefferson Airplane with the happiest sounds of the Mamas and the Papas. I suppose it worked for the most part, but these guys and gals couldn't quite rock with the insane acid-deranged drive of the Airplane, although they give it a shot here and there. Still, Grace Slick probably could've melted their heads 'Raiders of the Ark' style with her laser glare, y'know, if she really wanted too. Pushing this a notch above the rest is the production touch of Brian Wilson's buddy Gary Usher, who also produced the Byrds best albums (that weren't Mr. Tambourine Man) and was one of the masterminds behind Sagittarius of "My World Fell Down" notoriety. So even if this isn't the absolute best sunshine pop, it's definitely a notable slice of the real McCoy. "It's A Happening Place" gets us started off with a hippy anthem with some powerful vocals and some entertaining fuzz guitar painting a technicolor snake in the background. I then refer you to the middle of the album, as the groop gets a little too focused on staring at the sun and vaudeville for a few tracks. When they getting around to rocking properly again we're served up with "You Can't Be Found," which seems to be trying to make the "Paint It Black" melody into sunshine pop. Fortunately, it doesn't quite get that blissed out - the guitars are gritty and the lead vocalist insists on sneering a little bit. "Dark On You Now" is the prime female lead vocal on the album, and "You Should Know" and "The Most Up Till Now" would've gotten all the folks bouncing at the Summer of Love happening (and I suppose they likely did). Apparently, taking too much means that the verses should be super-twee as we discover on "You Took Too Much." 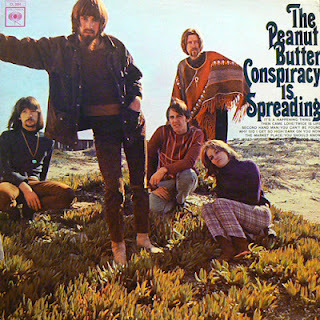 There's a lot of good tunes here and the Peanut Butter Conspiracy were worthwhile contestants in the sunshine pop sweepstakes, bringing in a touch more acid rock than their immediate peers. Matched with some great production from Gary Usher and fine group singing, this disc can make for a very groovy summertime diversion. Disappointed you didn't like this one more.